The fog of war envelops every battlefield. When the plan breaks down amid the chaos and ambiguity, how do young Marines know what to do next? How can they take relevant action in the present when their carefully detailed plan has been rendered useless? Every leader communicates something called Commander’s Intent — effectively an end state or envisioned future of the battlefield when all is said and done. Understanding this vision, even the most green Marines can take decisive, relevant action right now. 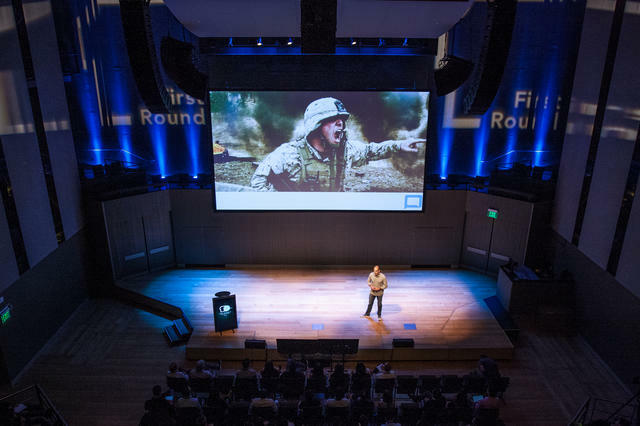 Managers should equip their people to achieve the same level of clarity in their careers, says Candor, Inc. co-founder and COO and former military leader Russ Laraway. Laraway believes that managers can grow and retain top talent by helping their employees articulate long-term vision for their careers. His approach has made him a sought-after advisor on the issue of employee retention and talent development. While at Google, his framework for career development led to more than a 10-point bump on engagement scores across hundreds of employees. In addition to Google, Laraway’s career spans operational and management roles at Twitter, founding and leading his own supply chain consulting firm and serving as a Company Commander in the Marine Corps, in which he oversaw 175 Marines. Drawing from his talk at First Round’s CEO Summit and additional conversations, Laraway explains a servant leader’s approach to career conversations, a tool that accelerates development, enhances engagement and boosts retention in teams. He lays out a step-by-step approach for creating meaningful dialogue and details pitfalls to avoid. Any startup seeking to keep its talent for the long term will gain helpful tips from Laraway’s framework. Companies face both a threat and an opportunity when it comes to their employees’ long term career aspirations. First, the threat: if managers just lead their employees merely with the day-to-day in mind, they’ll lose some of their best people sooner than they might have otherwise. Laraway has found that career conversations — deep, meaningful dialogue coupled with action plans around measurable goals — go a long way in keeping them around for longer. Leaders, do you have what you need to invest in your people with the same focus and fervor you want them to give your company? Candor, Inc.'s COO Russ Laraway speaks at First Round's CEO Summit. Performance reviews are backwards-looking, while career conversations are forward-looking. Performance reviews ≠ career conversations. It’s hard to keep books upright without bookends. You must understand someone's past and future to know how to order the present. Instead, take another path forward when it comes to career conversations. Laraway breaks down a three-step process for helping your employees develop both short- and long-term plans. Each of these steps involves about an hour of investment approximately two weeks apart from one another. These three approaches help surface the key components of your employee’s path: their past, present and future. Starting with kindergarten, tell me about your life. Then probe with more questions when they talk about pivots in their lives. Look for the patterns over the course of your people's lives that give you strong signal and just write them down. “In this case of the cheerleader-turned-swimmer, I wrote, ‘Hard work leads to tangible outcomes.’ Then I wrote down the story, ‘Cheerleader to swimmer,’” Laraway says. “It’s not rocket science. I had pages of notes that yielded a list of 5-10 values and motivators that helped us have a shared, textured understanding of what she cared about and what brought her to this point." 2. Spot their lighthouse and bring it into focus. Articulating a clear vision for an employee’s future is the most important step. Ask your employee about their dreams. What size company do you imagine working for? What industry do you want to be in? Do you want to be in a very senior individual contributor type role or very senior management type role? Laraway had an employee, Jane, who articulated this vision: Own and operate my own spirulina farm. 3. Create a career action plan. Armed with a shared and textured understanding of your employees’ key motivators, and a clear articulation of their own envisioned future, now you’re ready for the next step: crafting a detailed action plan. These will map out — in great detail — exactly how your employee is going to reach that vision for themselves. Think of it as a roadmap to self-actualization. At Candor, career action plans are developed into four parts. Each part has 2-5 action items. Each action item should answer: Who will do what by when? “If those three questions aren't answered, you don't have an action plan. What you have is that IDP exercise. Who will do what by when? That's an accountable plan. That's something you can work on and manage toward,” Laraway says. Enlist others to help hone their skills. Send your employees to training like conferences or workshops. But be mindful that you’re sending them to opportunities that actually make sense in the context of the long-term vision. For example, Laraway cites a highly popular Advanced Negotiations course that every single person wanted to take at the Wharton School — even if there was no clear reason why he or she needed it. When you understand someone's long-term career vision, it helps put training investments into context. Managers have the opportunity for service leadership but still must cope with the threat of good people leaving the organization. The key here is to intently invest in each employee, making sure they’re getting — and know that they’re getting — the tools and experiences they need to advance in the way they aspire to advance. No empty promotions or ceremonial performance reviews. Instead, aim for real, honest conversations that unearth your employees’ hopes and dreams, and shed light on their past and future. Doing so can extend the life of employees at your company, but also bring clarity to how and when they should embark on the next stage in pursuit of their dreams.